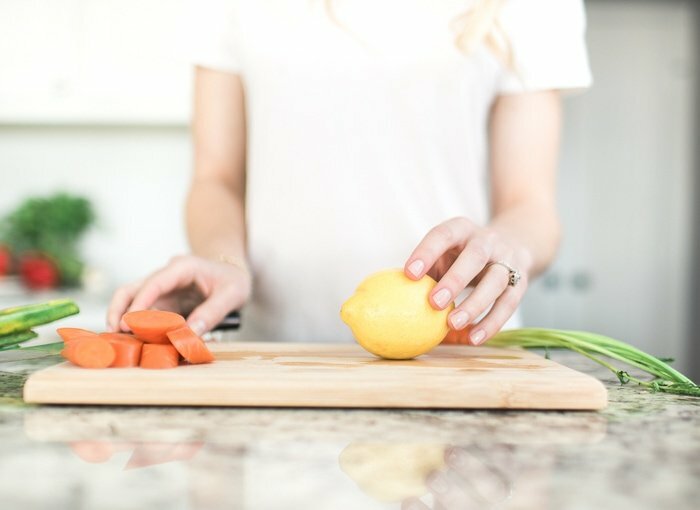 Celebrate National Nutrition Month, reduce food waste in your home, and make your food (and money) go further with these simple tips for reducing food waste. March is National Nutrition Month, and this year’s theme is Go Further With Food. To me, that means making nutritionally sound choices that will benefit your health, while also making a conscious effort to minimize food waste so that you can get more from your food and the money you spend on groceries. Americans throw out $218 billion of food annually. That’s more than enough food to feed the 42 million Americans who are food insecure each year. That food waste goes straight to landfills, producing harmful greenhouse gasses, impacting the environment both directly and indirectly as all the resources, like water, labor and energy, used to grow, produce, and transport that food also end up wasted. On a personal level, food waste just breaks my heart. I feel guilty throwing out food because not only am I throwing away money, but I’m also throwing out what could have gone to nourish somebody else, perhaps somebody less fortunate than me. 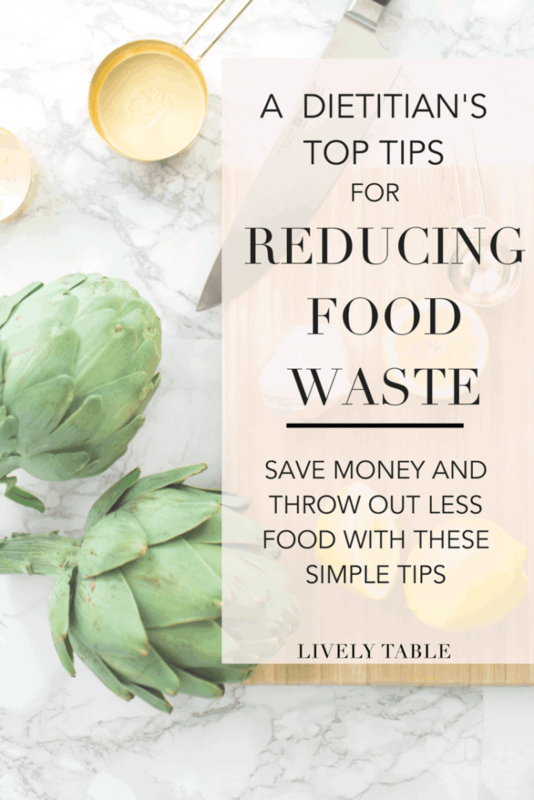 So I try to make every effort to keep the food waste in my house to a minimum, something I think we can all look at in our own homes and try to be mindful of as we go about our weeks. I encourage you to take a look at your own family’s habits and evaluate where you improve when it comes to throwing out food. Then incorporate some of these tips for reducing food waste into your everyday routine. Not only will you reduce the impact of food waste on the planet, but you’ll also save some money along the way. Reducing food waste starts before you go to the grocery store. Take a look in your refrigerator before you go shopping to evaluate what perishables you have that need to be used. Plan your meals and snacks for the week around what you already have and what will be going bad soon. Then make a list and stick to it. Buy only what you need until your next shopping trip to avoid buying too much food that might not get eaten before it spoils. Speaking of food spoiling, pay attention to what is about to go bad that you aren’t going to get to. Freeze what you can to avoid throwing out fruit, vegetables, yogurt, milk, meat, fish, and prepared dishes like soups. Freeze milk and yogurt in ice cube trays and freeze fruit, like berries or sliced bananas, and leafy greens for smoothies. Place poultry and meat or fish in the freezer (we love our vacuum sealer for this) for later meals. You can also freeze soups and stews, cooked grains, and other prepared dishes to eat later when you don’t have time to meal prep. Vegetables like green beans, broccoli and asparagus can be blanched before freezing for a side dish that cooks quickly when you need it. You can also freeze small amounts of vegetables like peppers, mushrooms and onions to be used in omelets, casseroles, and soup as they build up. Finally, make pesto out of fresh herbs and freeze it in ice cube trays to quickly add flavor to weeknight meals. Shopping in bulk can be a great way to save money, but it’s not a good deal if you end up throwing it away. Make sure your family will eat what you buy before it goes bad. We like to vacuum seal meat, poultry and fish and freeze it if there is a good deal on bigger packages. The same goes with fresh fruit and vegetables. Even if they are on special, resist the urge to buy too much that could end up spoiling. Instead of making one big grocery trip, make a couple of smaller ones throughout the week. Despite our best intentions, plans can change and you may end up eating out or eating leftovers one night instead of cooking. If you only shop for the next few days at once, you are more likely to buy only what you need, knowing you’re coming back to the store in a few days. Leftovers don’t do any good sitting in your fridge if you don’t eat them. We usually put our leftovers into individual portions for lunches. If you aren’t a big fan of reheated leftovers, try to repurpose your leftover food into new meals. Roasted vegetables can always be turned into a delicious grain bowl or breakfast scramble, while leftover chicken can be turned into anything from chicken salad to enchiladas. Get creative! Try to place things that spoil more quickly where you can see them so you don’t forget they are there. Try placing fruit or cut-up vegetables in see-through containers at eye level. Also make sure you keep your refrigerator clean and uncluttered so that food doesn’t get pushed to the back to spoil. Over-stuffed fridges and freezers run less efficiently, costing you money and circulating cool air poorly. Sadly, produce that doesn’t look pristine often doesn’t get sold from grocery store shelves despite being perfectly edible. Make an effort to buy the awkward shaped fruits and veggies so that they don’t get tossed out. And don’t ignore the less than perfect produce in your fridge. A small bruise can easily be cut away so that you can enjoy the rest. Have you ever thought about why you cut out the kale stalks or peel your carrots? You really don’t have to. I usually don’t. Even if you do cut away things like broccoli stalks, you can use them, along with things like beet or radish greens, in salads, soups or stir-fries. Greens like carrot tops can also be used in pesto. Finally, plenty of other scraps, like onion, carrot and celery ends, herb stalks, parmesan rinds, and chicken carcasses can be used to make homemade broth. I realize composting is not practical for everyone. It certainly isn’t for us (our dogs will eat it and get sick), but if you can, throw any food scraps you have in a compost pile. Dogs and chickens are also great composters. Our dogs love zucchini ends, salmon skin, and apple cores for treats on top their dog food. While you don’t want to throw out food that is still good to eat, don’t risk it when it comes to food safety for you and your family. If something smells funky or has mold or slime growing on it, toss it. Prepared dishes, proteins and dairy foods that have been left out for more than 2-4 hours should not be eaten, especially in hot weather. Also don’t use cans that are rusted or dented. Stats taken from this report by the NRDC. Hehe our dog loves scraps too! He loves carrot peels and iceberg lettuce the most. We also meal plan and I grocery shop once a week. I only cook dinner about 2-3 times a week and my husband and I eat the same dinner two or three nights in a row and it works for us! Thanks Chelsea! So great that you’re teaching a class on reducing waste!